Turn that classic combination of peanut butter and chocolate into a great no-bake candy. 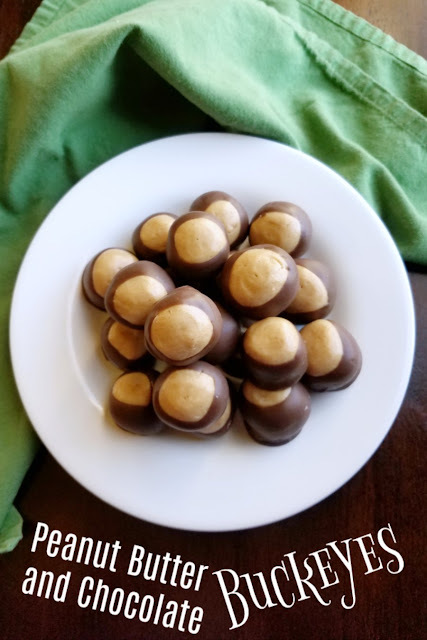 These buckeyes look like the nut, but taste much better! Turn peanut butter and chocolate into delicious no bake candy. This is a Christmastime must have in our family. These candies are easy to make, which is good because they disappear quickly. 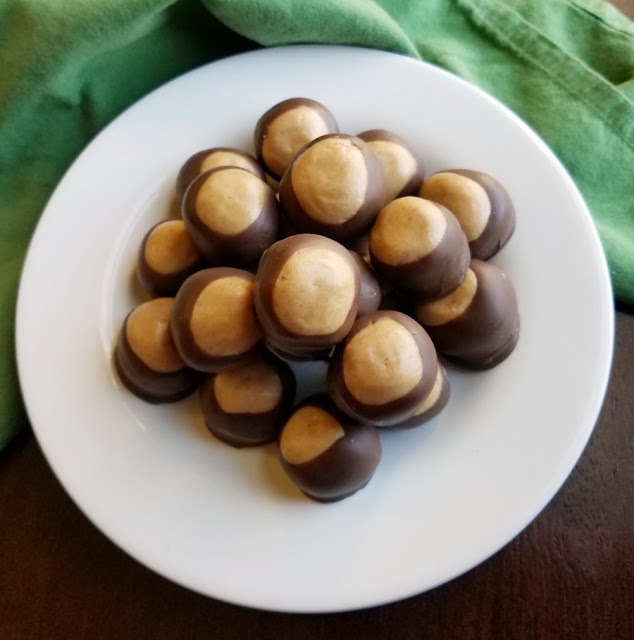 These buckeyes deserve a place on your holiday candy making list! 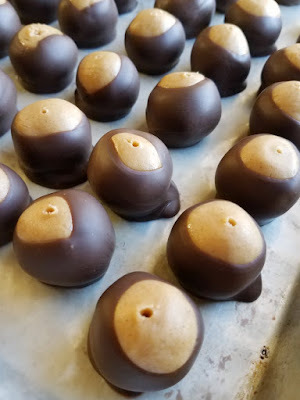 Buckeyes tastes a lot like Reese's peanut butter cups, but look even more fun. It's namesake is the nut of the state tree of Ohio, but it is worth making worldwide! By now you know that my family runs the chocolate and peanut butter fan club. Ok, maybe not officially, but we might as well! We love this combo in sheet cake form, ice cream, cookies, pie, puppy chow, crazy delicious layered desserts, and even as playdough and acorns! But buckeyes are one of our favorites. We only make them at Christmas time, so it gives us something to look forward to. MiMi has made them in bar form before too, which is quicker and just as delicious. However I think the real thing is more fun. After all, they look just like buckeyes! Little Dude has always enjoyed helping in the kitchen. Above is a pic from a few years ago when he helped make the filling. Today he helped dip the balls as well. He is growing so fast! All you have to do is whip up the filling and I roll it into balls. Dipping them in chocolate is a lot easier if you have the time to freeze them for a bit. It's not totally necesary, but it is my preferred method for sure. Our favorite way to dip the balls is to use a toothpick. Just insert it into a peanut butter ball and dip it in the melted chocolate. Swirl it until most of the ball is covered, but leave a small patch of peanut butter showing. Put the dipped ball on wax paper and use a finger to gently nudge the ball off the toothpick. Allow to set completely. Then you can use a finger tip to close the hole and create a smooth finish on the top of the buckeye. While we were at it, we went ahead and melted a bunch of chocolate. That way we could do pretzels and Rudolph marshmallows while we were at it. While you are going, you might as well go big! 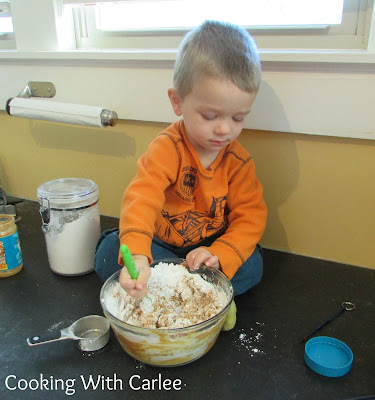 Mix together the peanut butter, butter, powdered sugar, vanilla and salt. The mixture might be a little crumbly to start, but a few kneads should bring it together. Roll mixture into balls. Since you aren't baking them, you can make them whatever size you'd like. I made mine about a couple of teaspoons each so that we could have a lot of smaller balls. 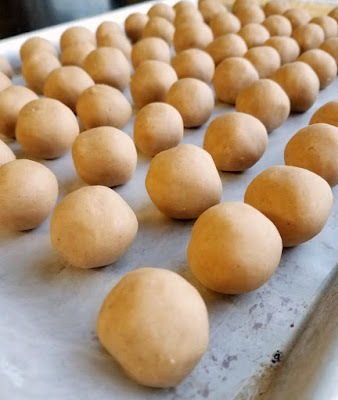 Place balls on wax paper lined baking sheets and put them in the freezer for at least a half hour. Melt chocolate melts in a double boiler. 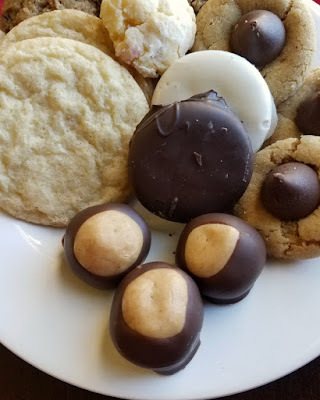 Using a toothpick to hold the peanut butter balls, dip them into the melted chocolate covering all but a small bit of the ball. Place back onto the wax paper and allow to set up completely. You definitely need to make them sometime, Michele! They are so easy and so good. And I do have a pretty good helper! I only make these at Christmas too and I swear I dipped like 200 balls this year and they are all gone already!! That double boiler is not coming out til next year, lol. I love that you added a pinch of salt, so doing that next time!! I've always wanted to make Buckeye's and for some unknown reason, I never get to them! Yours look so good! You have to make them! They are so easy and so good! Yum yum yum. Love these. I need them in my belly now. Chocolate and peanut butter are a match made in heaven. Ps. Your son is absolutely adorable and such a stunning helper. My sis-in-law used to make these every Christmas. Since she has passed on, my daughter had taken on the job. With her business exploding, she is so busy this year that I may have to do it! Aren't they the best? It wouldn't be Christmas without them! I have actually never heard of these candies, but they are definitely up our alley - peanut butter and chocolate! Oh my goodness, you have to make some. They are soooooooo good! You sure have a precious helper that will make these Buckeyes very special! Wishing you a very Merry Christmas and thanks so much for sharing your awesome post with us at Full Plate Thursday! He does make these things so much more fun. Thanks and merry Christmas, Miz Helen!